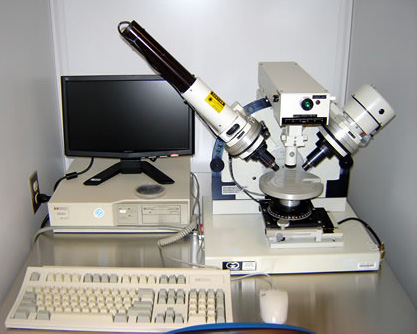 Located on the 1st floor in the Silvio O. Conte National Center for Polymer Research the Nanofabrication facility is part of a network of cleanroom laboratories that offer both unique and complimentary capabilities. 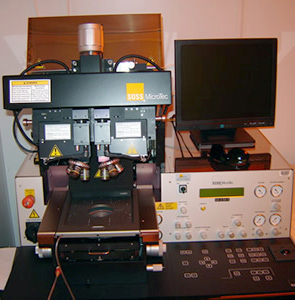 Training can be tailored to the specific set of processes or techniques needed to fabricate and test various devices or materials. 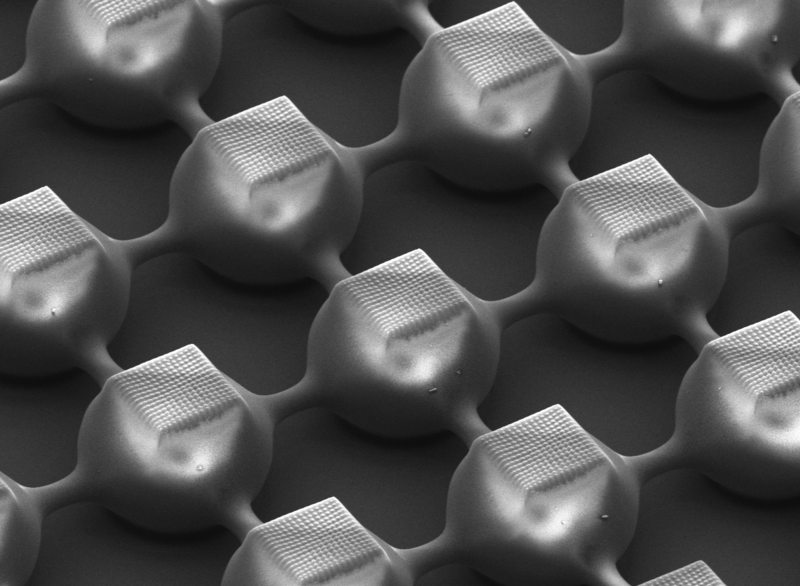 Films of numerous metals and ceramics can be applied and patterning as small as 10 nm can be accomplished. A wet chemistry area provides a safe environment for the use of a variety of coatings, solvents, and etchants. 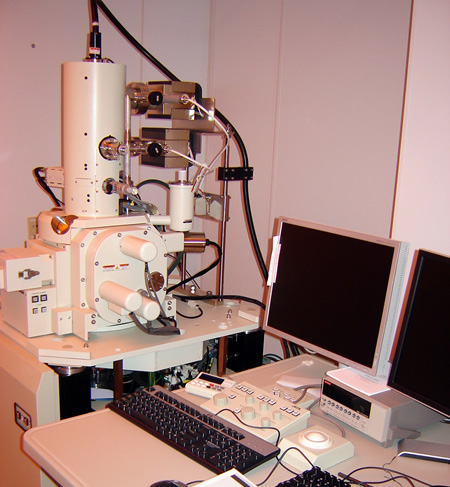 The Electron Beam Lithography system is based on a JEOL JSM-7001F Thermal Field Emission SEM equipped with a Nabity Nanometer Pattern Generation System which supports e-beam lithography and an image database. 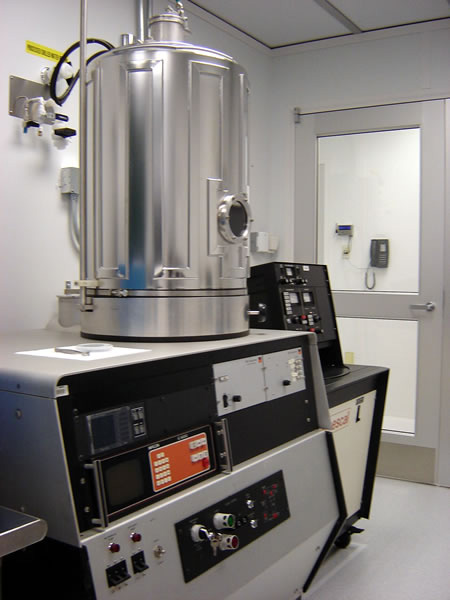 The STS Vision 310 Plasma Enhanced Chemical Vapor Deposition system is equipped with a patented frequency generator that allows for the deposition of low stress films. It is configured for the growth of silicon dioxide, silicon nitride, and amorphous silicon. Available gases are 2% silane/nitrogen, ammonia, nitrous oxide, tetrafluoromethane, oxygen, methane, and nitrogen. 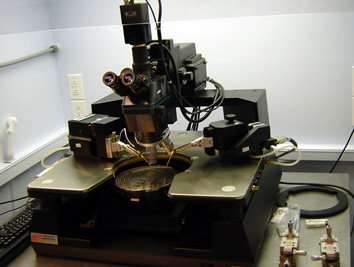 The STS Vision 320 Reactive Ion Etch system is configured to etch silicon dioxide, silicon nitride, and amorphous slicon. Available gases are hydrogen, methane, sulphur hexafluoride, trifluoromethane, oxygen, argon, and nitrogen. The Gaertner L116C Ellipsometer offers noncontact measurement of transparent and translucent films using a 632.2 nm wavelength HeNe laser. 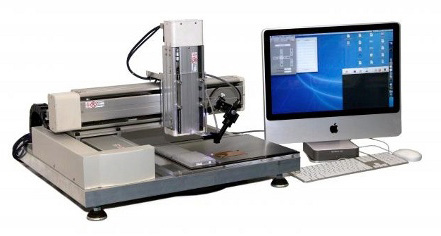 The rotating analyzer samples 144 data points and can measure films of thickness from 0 to 60000 Å with an accuracy of +/-3 Å and a repeatability of +/-1 Å over most of the measurement range. The load-locked AJA ORION 8 Sputtering System currently has three RF and four DC confocal magnetron sputtering sources installed. Current source materials available include copper, aluminum, silicon dioxide, titanium dioxide, aluminum oxide, indium tin oxide, magnesium oxide, tantalum oxide, cobalt, palladium, niobium, silver, nickel, tantalum, sammarium, sammarium cobalt, zirconium, chromium, vanadium, and Permalloy (Ni/Fe). Programmable control of deposition parameters and cycling allows simultaneous or sequential deposition and repetition of deposition cycles. Substrate heating up to 750°C is also programmable. 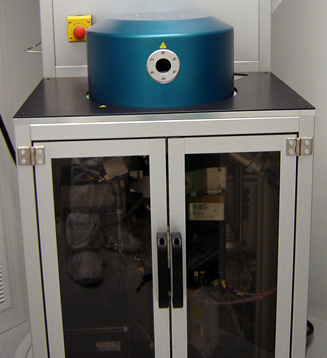 The CHA SE-600 electron beam evaporator with a 4 pocket hearth has been retrofitted with a cryopump to decrease the pumping cycle time. More than twenty different metals can be evaporated including gold, platinum, palladium, silver, copper, aluminum, nickel, and titanium. 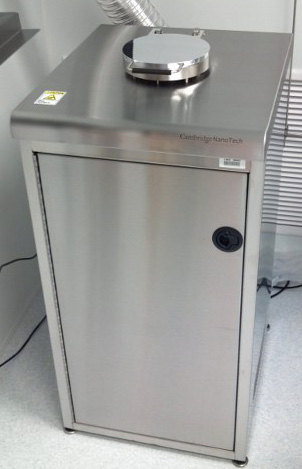 The Cambridge NanoTech Savannah 100 Atomic Layer Deposition (ALD) system is available to deposit very conformal and precise thicknesses of various thin films. 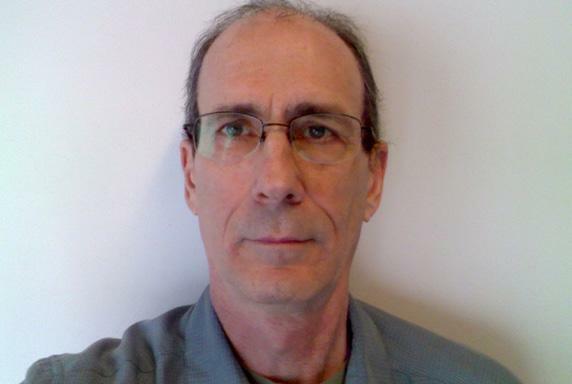 Our unit can currently be configured with the precursor chemicals to deposit hafnium oxide, aluminum oxide, titanium dioxide, zinc oxide, and platinum. 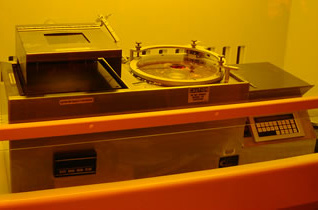 The Wentwort MP-2300 semiautomatic 200mm wafer prober is equipped with Labmaster 5.1 probing environment software and has a motorized XY- theta stage with 203mm x 203mm XY travel with 0.1um resolution and 5 mm Z travel and a 200mm nickel plated wafer chuck with vacuum hold down. 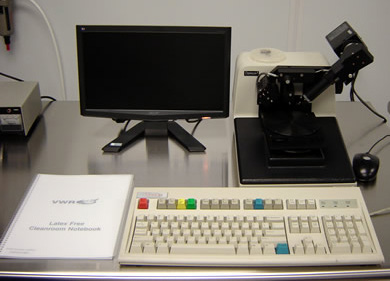 Probers include a CAP3000 computer assisted probe with 0.1 um resolution, a CAP4000 submicron computer assisted probe with 0.01 um resolution and two lower resolution manual probers. 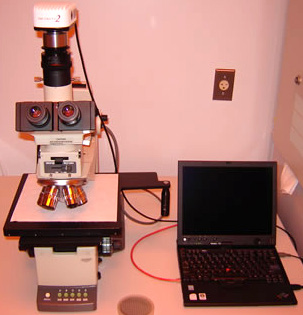 A Mitutoyo FS-70 microscope with motorized xyz movement and M Plan Apo 5x,10x,20x objectives and Pulnix TMC-7 CCD camera with flat panel monitor and motorized focus allow for visual scanning and image capture. 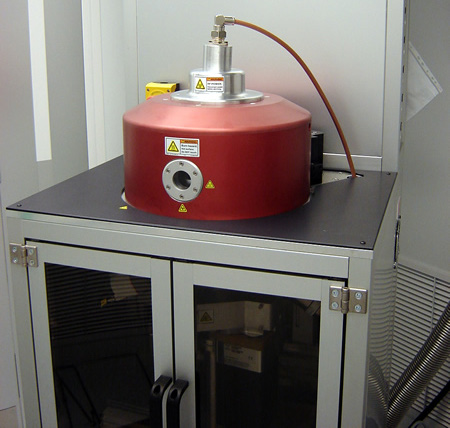 A Newport Cleantop II vibration isolation table with maximum damping and a laminar flow hood provide a controlled probing environment. 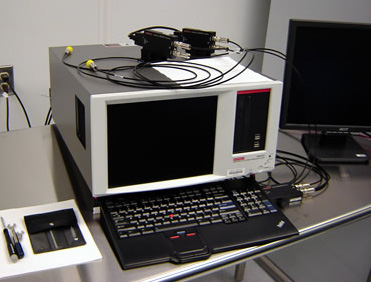 The Keithley 4200 Semiconductor Characterization System is a parametric analyzer with a Windows XP based software environment which provides for measurement of DC I-V, C-V, and pulse characterization and stress- measurement/reliability testing of semiconductor devices and test structures. 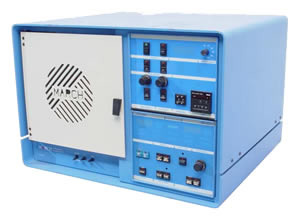 This instrument is equipped with a Capacitance Voltage Unit capable of nanoFarad (nF) level measurements at frequencies from 10kHz to 10MHz and also two Source-Measure Units with 1A/20W capability. Two Remote PreAmps extend the resolution of both SMUs from 100fA to 0.1fA. The Veeco Dektak3 surface profile measurement system is capable of scans up to 30 mm with a 10 Å repeatability and the sensitivity to measure step heights below 100 Å. 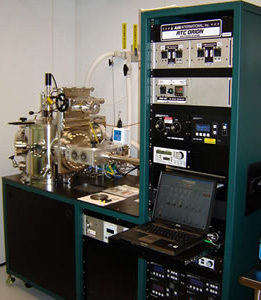 The PM-600 is a large barrel benchtop plasma system with a 13.56 MHz RF generator having an output power of up to 600W for stripping photoresist, cleaning substrates, and mild etching. It has a 10 in. diameter by 12 in. long quartz chamber with an 8 inch by 8 inch flat quartz glass substrate rack Quartz glass wafer racks are available for 3” diameter wafers. It is microprocessor based with automatic sequencing and manual override. 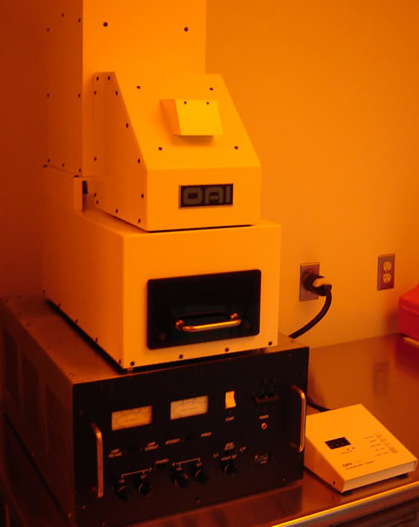 The OAI 1000 Watt DUV Exposure System is capable of exposing substrates up to 150 mm diameter to a 1000W ~250nm wavelength deep ultra-violet light source. 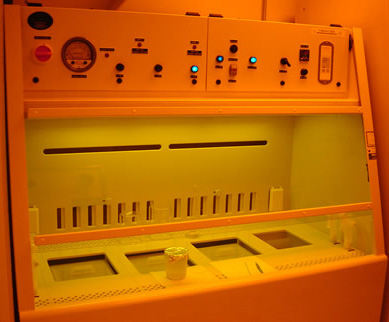 Samples are placed in the exposure chamber and the time of exposure can be varied - the power setting is always 1000W. 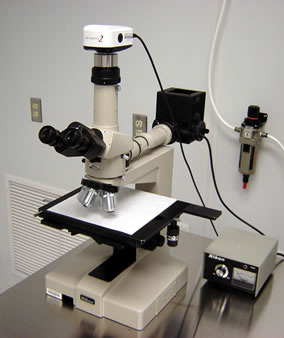 The Olympus BH2 Microscope with Infinity 2 high resolution (2080x1536 pixel) digital camera is capable of up to 1000x magnification and has a 6 in. x 6 in. stage with manual positioning lever and xy stage control knobs. Image captures on the attached notebook computer canbe analyzed, labeled or formatted, and saved to network storage areas via the internet. Nosepiece rotation is under push button control. A UV mask aligner and exposure system with split screen stereo camera alignment system capable of both front and back side alignment of from 2” to 6” diameter substrates. The Brewer Science CEE 100CB Spin Coater and Hot Plate is capable of storing up to 10 spin regimes which may include spin speed ramp rate, stepped spin speeds, and a nitrogen float or vacuum hot plate contact mode for photoresist curing. Chucks for substrates from 1” to 6” diameter are available. 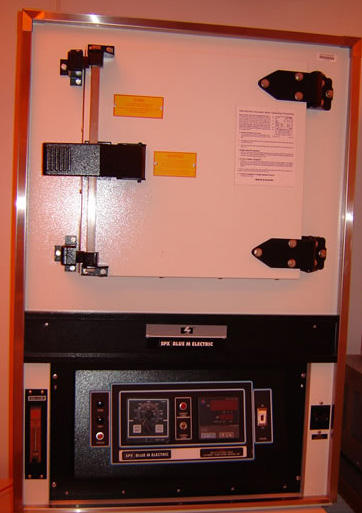 The Developer Hood has a flowing deionized water rinse sink and developer solution sinks for the positive and negative resists commonly used in the facility. DI rinse wands and N2 guns are provided. training on safe use of wet chemistry benches. The cleanroom lab is located on the campus of UMass Amherst, in the Silvio O. Conte National Center for Polymer Research, room B-132. Make a payment to the Nanofabrication Cleanroom.